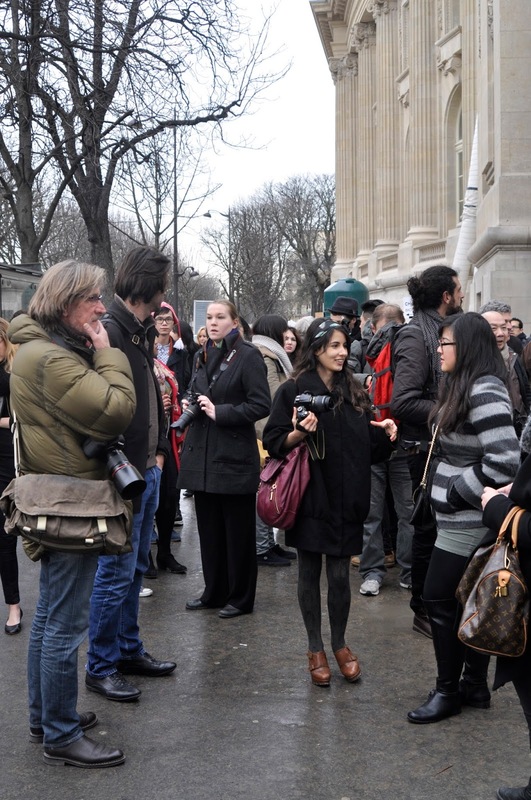 Trust the French to turn Fashion Week into three weeks of excitement, parties and photo-opportunities. Last Monday marked the beginning of the Spring/Summer shows of Haute Couture. Of the 20-plus designers who were scheduled to show over the four day I was only able to make it* to one: Chanel. 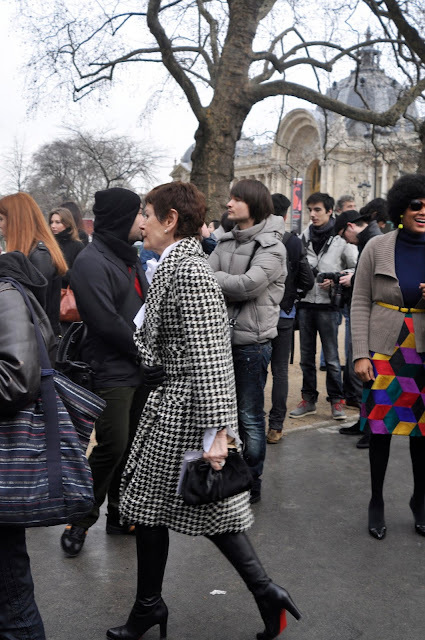 *And of course, by make it, I mean I had time during the day to stand outside the Grand Palais and photograph famous women who had tickets to see the runway show. Glad we cleared that one up. Never mind that Thursday was the week of electronics-hell, since my camera was still working I had everything I needed. The show was scheduled to begin at 10h, and in the true spirit of all-things-fashionable, I arrived at quarter-til, hoping for a chance to spot anyone who strategically waited to arrive late. Chanel + Karl Lagerfeld have shown at the Grand Palais for many seasons, and for good reason: the building is centrally located between the Champs Elysees and the Seine, with a grandious stone and glass exterior. 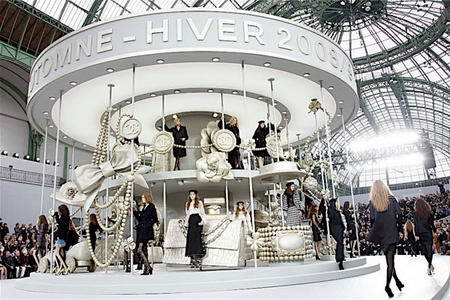 The space inside is perfect to stage creatively set shows, and Chanel has taken advantage of this: who could forgot their carousel-themed center stage. Look familiar? 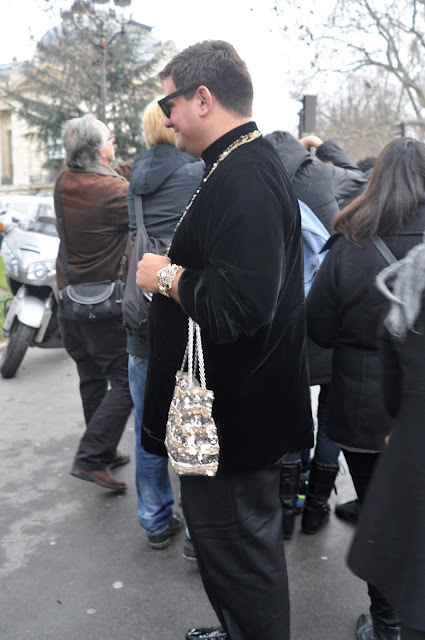 The photo below, from Vogue.fr, proves that you don't have to be famous to make it, just a bit aggressive and stubborn. I'm at left, wearing a less-than-photogenic safari jacket and new black ankle boots, which are so amaze that they deserve their own post. Leave it to the bloggers and photographers to be dressed fabulously as well, some even better than the actual show attendees proving that true style doesn't come from logos or head-to-toe designer looks. I was intrigued by this little woman whose large leopard coat kept her from being a complete doppelgänger to the Incredibles' Edna Mode. 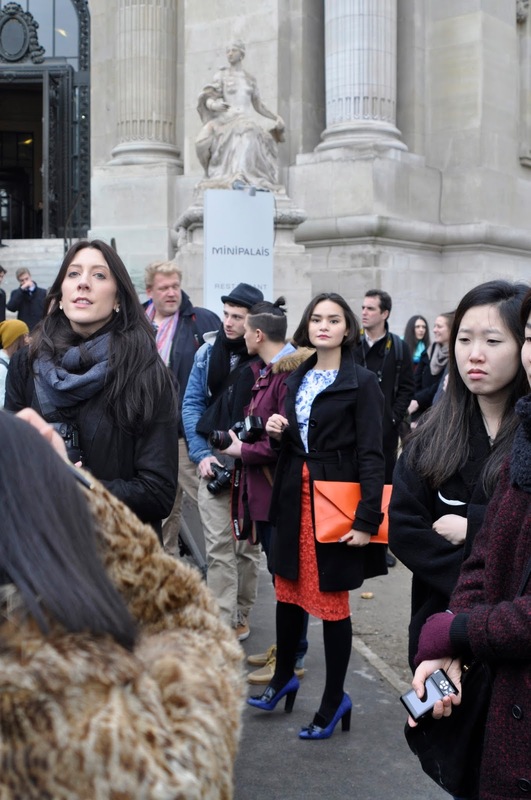 A quick and well timed glance proved to explain the familiarity: she works for Elle. In a sea of black and denim, this lovely ensemble of bright orange and cobalt caught my eye and I was envious of both her color coordination and the practical heel on her tasseled loafer pumps. One must always been comfortable when stalking down celebrities! These pants were my favorite of the day--I love the colorful patterns, toned down and day-time appropriate in a breezy trouser cut pant. I was envious of her bold burgundy colored bag and the effortless chic of her headscarf, a concept I have not yet mastered. The monochromatic palette of this outfit is perfect for winter, and her feathered handbag is a fun, unexpected touch of whimsy. Never one for winterhead bands, I'll admit this braided style works quite well. This is amazing and that first outfit is rocking and that dress is hot.